Left: Sudanese President Omar al-Bashir. Right: U.S. President Donald Trump. Khartoum — Sudan has welcomed launching of the Second Phase of Strategic Dialogue with the United States of America which was set to expand scope of bilateral cooperation and achieve further progress in a number of fields of mutual concern , especially after success of the first phase which was crowned by lifting sanctions against Sudan. It is to be noted that Foreign Minister, Dr Al-Dirdiri Mohamed Ahmed and within context of his current visit to Washington met with the US Deputy Secretary of State, John Sullivan. Foreign Ministry Official Spokesman, Ambassador Babiker Al-Sidiq said it has been agreed upon launching the second phase of strategic cooperation between the two countries which will lead to removing Sudan from list of state sponsors of terrorism. 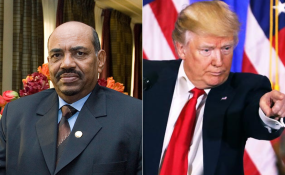 He said that Sudan welcomes US announcement that it ready to engage in stage of removing Sudan from list of state sponsors of terrorism and to foster relations and cooperation between the two countries , stressing Sudan readiness to engage in tracks of the second phase for reaching the aspired goals.